Description: A QUICK YARD MOVE, LOOKING UP SEMINARY STREET TOWARDS HI-LO GROCERY STORE AND THE EDGE OF TOWN. 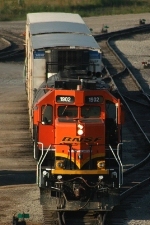 Description: Lead unit of an A-B-A set of BNSF SD40-2s! Description: Another shot of some of the front lines of engines.